As many of you, I grew up going to Costco frequently with my parents. Our home was filled with super-sized packages of absolutely everything — toilet paper, cereal, salad dressing, and tubs and tubs of margarine. As an adult I followed suit and continued shopping Costco, even though I was only shopping for 2-3.5 people. A few years ago, I got serious about saving money and started couponing like a madwoman. As I refined my couponing and money-saving skills, I discovered that I was saving big money at the grocery store and started to shop Costco less and less until one day we just gave up our membership. Now that we have seven children (oye! ), I have rediscovered my affection for Costco (and specifically their selection of family-sized frozen entrees). Plus, not much can beat a Polish and soda for $1.50, right? 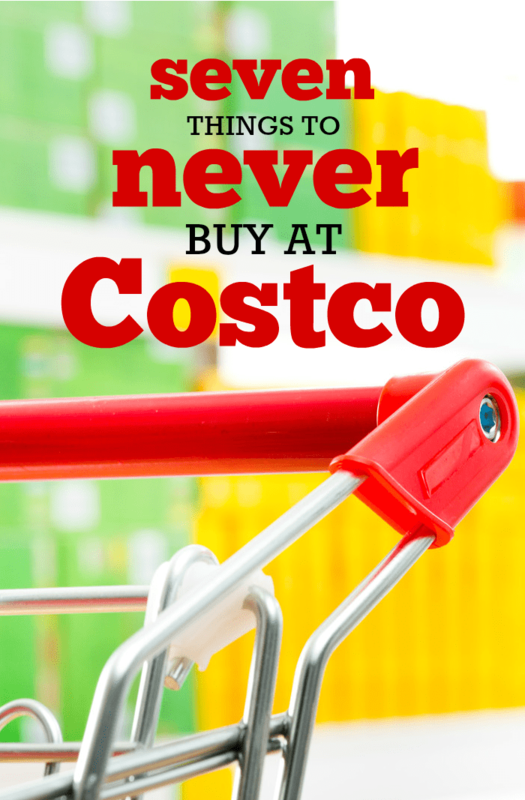 I typically shop Costco once a month, but have a better understanding of what is a good deal and what isn’t. Nine times out of ten, you can get your personal care items for significantly less with manufacturer’s coupons at the drug store, Walmart, or Target. The only time I’ve ever broken my “never buy toiletries at Costco” rule is when there’s a Costco instant rebate available on a specific brand I already love. For example, I’m loyal to a particular variety of Dove deodorant. Deals that involve manufacturer’s coupons or store incentives come about once a year for this particular deodorant, so I jumped on a Costco discount a few months ago. Now I have 5 sticks for a nice discount and didn’t have to wait for the couponing stars to align. I gave up saving money for the convenience. You can regularly get smokin’ deals on ketchup, mustard, mayo, salad dressing at least once a month at the grocery store with manufacturer’s coupons, so skip the giant tubs of sauces and wait for a great store sale. If you have a Franz or Oroweat bakery outlet nearby, you can save up to 50% off Costco prices on all of your bread needs (loaves, buns, rolls, bagels, English muffins). My local Oroweat bakery has the same Costco 2-packs of whole wheat sandwich bread for right around $2. I purchase outlet loaves all the time and there’s never been a noticeable difference in quality. Sometimes the loaves are actually bigger than they are supposed to! Find a Franz Bakery Outlet here and an Oroweat Bakery Outlet here. I’ve been diapering bottoms since 2004, and I have always been able to beat Costco diaper and wipes prices (even during the instant rebate months) with manufacturer’s coupons, Target gift card deals, and Amazon Subscribe & Save deals. The key is that I am willing to use different brands. As long as the price is right, I’ll buy. My personal “buy” price for diapers is 16¢ per size 4 diaper and less than 2¢ per baby wipe. I’ve found that Walgreens store diapers (purchased on a BOGO sale) and Target’s up&up diapers (purchased during a hot gift card + Target store coupon promotion) work just as well as Kirkland Signature and Huggies. There have been times in my children’s lives that they needed Huggies as nighttime diapers and I’ve found fantastic deals by waiting for the right price on Amazon then stocking up. I agree, those large boxes of kid-sized goodies are incredibly appealing, especially when they drop the price right before school starts in the fall, but I guarantee you can get the same items for less using a manufacturer’s coupon during a great store sale at your local grocery store. You can save even more if you buy a big box and repackage them in baggies yourself. If you’re serious about saving money on meat, hands down you need to be ordering in bulk from Savory Butcher. These companies work directly with farmers and processors to get you the best deal on chicken breast, ground beef, bacon, and more. I’ve been buying my chicken breast in bulk for years and I always pay less per pound than Costco’s Foster Farms packs. We’re coming close to the holy grail of the couponing calendar: baking deals. Grocery stores will slash prices on baking and cooking foods from late October to early December plus manufacturers will release higher-value coupons making for some amazing prices. This fall, you should be able to beat Costco’s prices on flour, sugar, chocolate chips, yeast, chicken stock, canned tomatoes and vegetables, cooking oil, and more. If you have a WinCo nearby, their bulk section typically beats Costco’s prices on pantry staples plus you can buy only what you need instead of feed-sack sized packaging. Honestly, there are sometimes that I purchase some of these items at Costco because it’s so stinkin’ convenient (remember the seven kids part? ), but I know that shopping strategically, combining manufacturer’s coupons and store promotions, at the grocery store or drug store will be cheaper than buying the same item at Costco. Costco Price List (with over 100o Costco Products)! This is a guest post by Angela Davis from Frugal Living NW – check out her guide for 10 ways to spend less on groceries.